While many may not have played a Telltale game until their breakout hit, The Walking Dead, the company has been making episodic adventure games for years now. The first game they worked on was Sam and Max Save the World. Does it hold up? Was it ever that good? Let’s take a look. 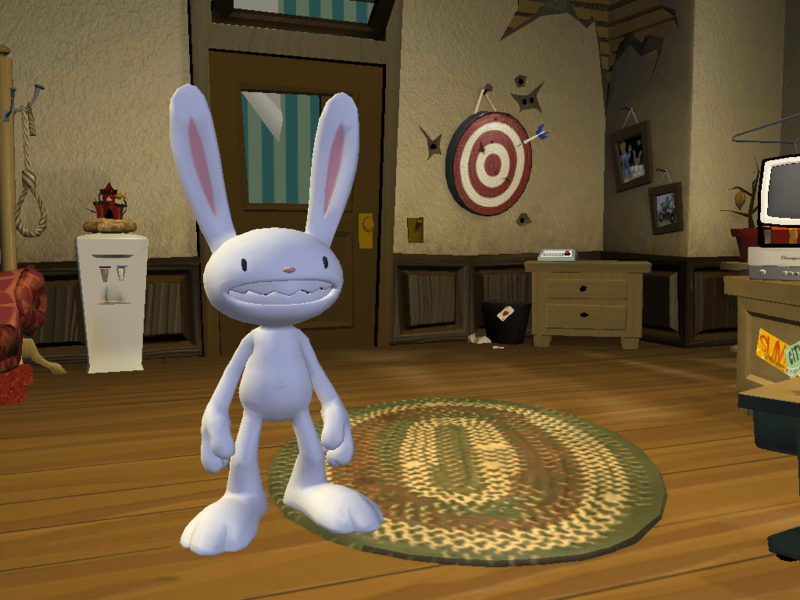 The duo of Sam and Max started in the childhood home of Steve Purcell. 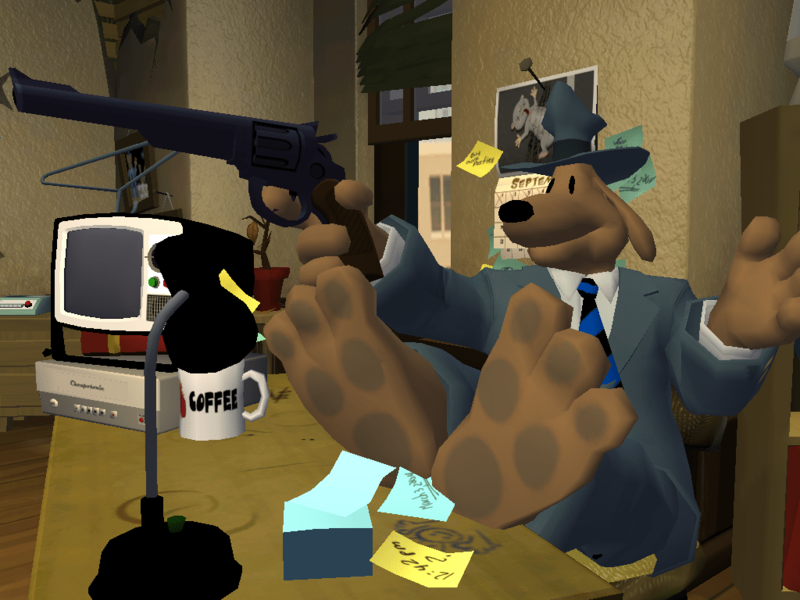 Sam was a hard-nosed, noir-style detective that just happened to be a dog, and Max was described as a “hyperkinetic rabbity-thing.” Steve got his first chance to use his characters in the comic, Sam and Max. 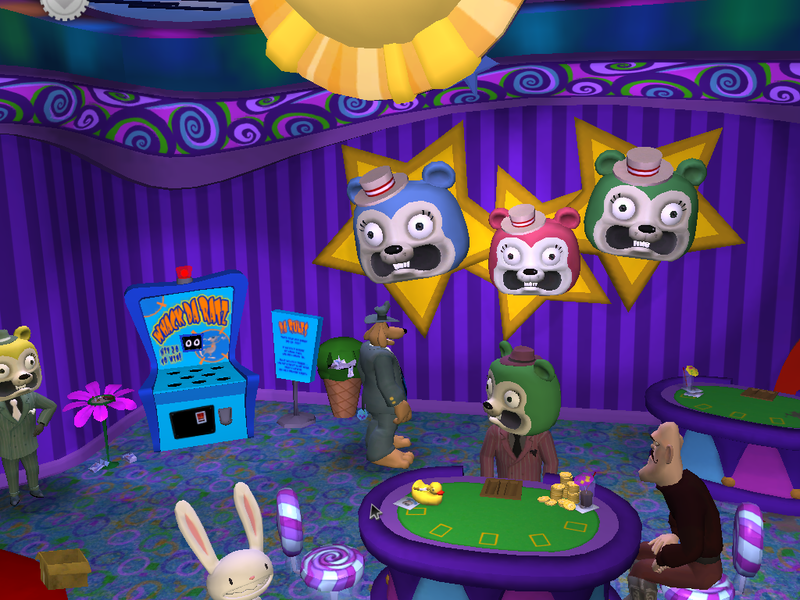 When Purcell was hired at LucasArts in the mid-90s, he was eventually able to get his characters into a LucasArts game, Sam and Max Hit the Road. After a failed attempt at a sequel, the LucasArts adventure team fell apart. Some of the staff left to create their own studio, Telltale Games. For their first outing, they wanted to revive Sam and Max, and, thus, the three seasons of Sam and Max were born. 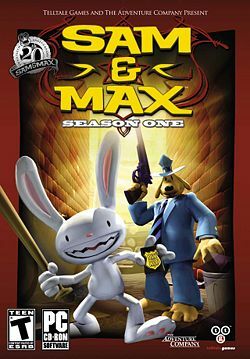 The first season was collectively called Sam and Max Save the World. Though, you will not need to have any prior experience with the characters. You’ll learn every thing you need to know about them in the first 5 minutes or less. Case in point: the intro to episode 4, Abe Lincoln Must Die! Now, if you played The Walking Dead, Sam and Max is nothing like that (if the above video didn’t already make that abundantly obvious). The story isn’t deep or challenging, there are no alternate paths, and the game is riddled with gimmicky puzzles designed to stump you. This was made before Telltale figured out that gimmicky puzzles weren’t what people play adventure games for. 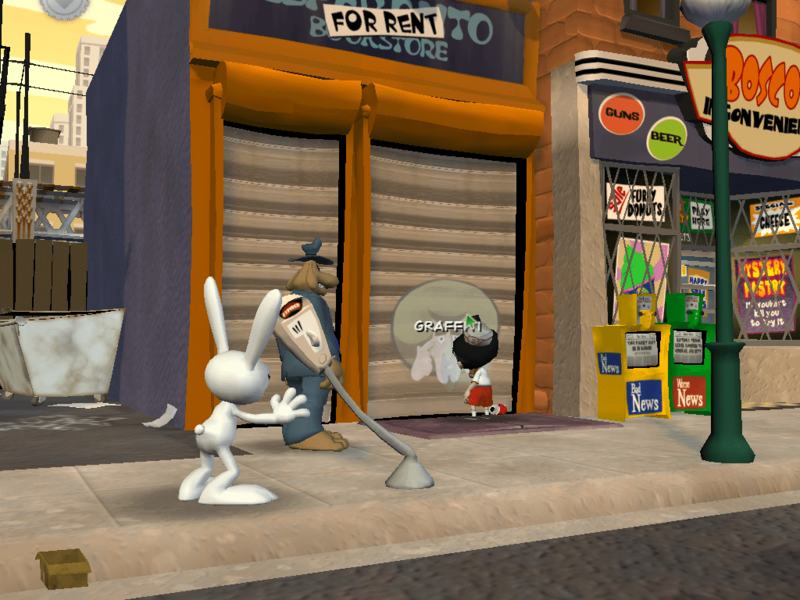 However, the Sam and Max characters were designed for comedy, and this game delivers comedy in spades. Having a hyperkinetic rabbity-thing as a sidekick might not be good for one’s health and well-being, but it sure leads to some humorous dialogue. And, while the puzzles are head-scratchers at times, I didn’t need hints or a walkthrough until the fifth episode, and only on one puzzle in that episode. The sixth episode was a little harder, requiring me to break out the walkthrough a couple of times. There is no hint system, so the walkthrough will be necessary if you get stuck. I played the PC version, and I can tell you that Season One will run well on the most barebones of hardware. My six year old laptop ran Episode Four just fine when I got it off Steam, and my current laptop (equipped with an i3 and onboard graphics) runs it fine with all the settings cranked up. To be honest, I’m not really surprised, since the game was ported to the Wii. I’ll warn you though, there is no widescreen resolution. Normally, I wouldn’t nitpick like that, but it bugs me because my laptop maintains the 4:3 aspect ratio. Chances are you won’t have that problem (this is the first machine I’ve ever had do that), but I thought I’d bring it up. 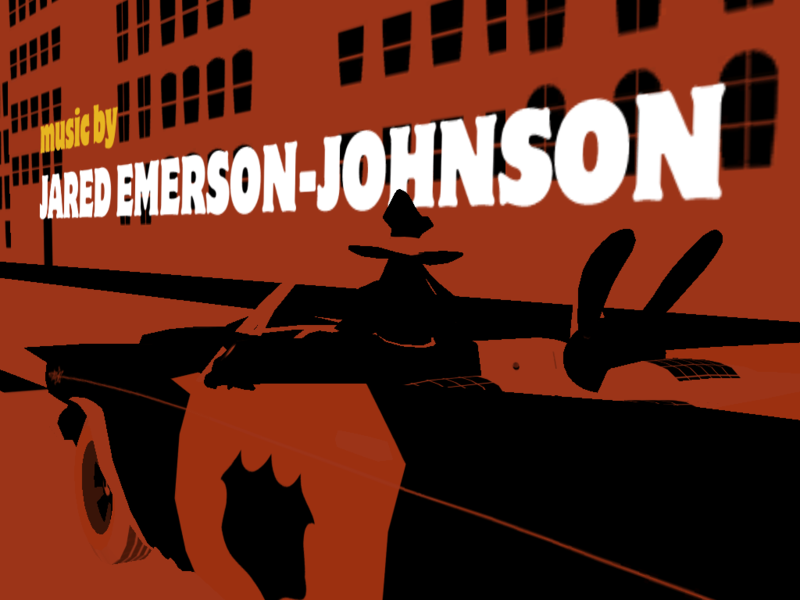 The controls are simple: point-and-click (somewhat like 5 Days a Stranger). If you know how to use a mouse, you’ll be able to play this game just fine. The game world is very small, but you can explore it to your heart’s content (in fact, it’ll be required to solve all the puzzles the game throws your way). You can save at any time, which is helpful if you need to check a walkthrough. Since Telltale only does episodic adventure games (with brief diversions into poker), it should come as no surprise that the Sam and Max games are split into episodes. Each episode takes about an hour or two to complete. They are as follows. One time child-stars, the Soda Poppers (Specs, Whizzer, and Peepers), are causing trouble throughout the city. Specs is drawing graffiti of a strange man in an afro, Whizzer is giving away video tapes (yes, video tapes), and Peepers is claiming to be Sybil Pandemik, psychologist. All the Soda Poppers are obsessed with one Brady Culture. Who is this Brady Culture? Talk-show host Myra Stump has been holding her audience hostage for days now. It’s up to Sam and Max to get on her show to stop the madness. To do so, they’ll need to become TV stars, get a record contract and be involved in a controversy. 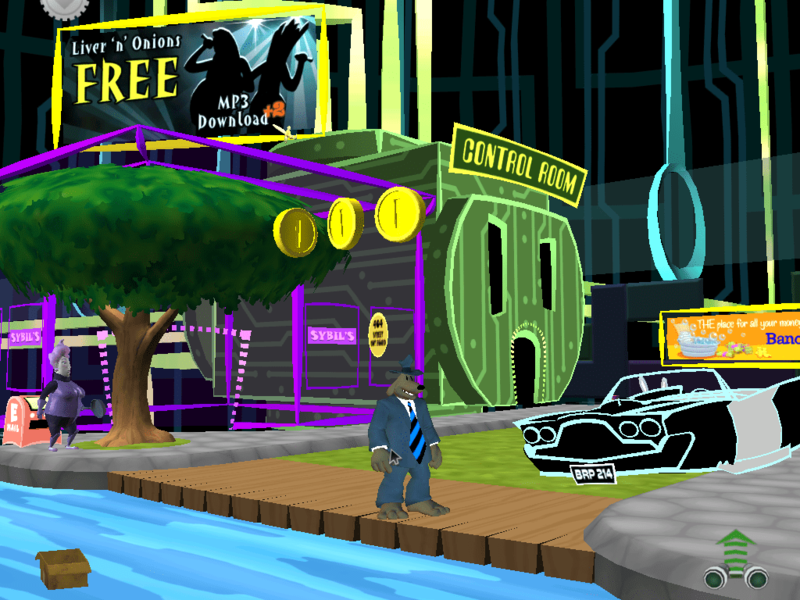 In this episode, Sam and Max have to infiltrate the Toy Mafia to find a mole with information to take down the Mafia. To do so, they’ll need to kill Sybil Pandemik, deliver goods to Bosco’s store and get back the Toy Mafia’s prize meatball sub sandwich. No, no time-travel in this one. 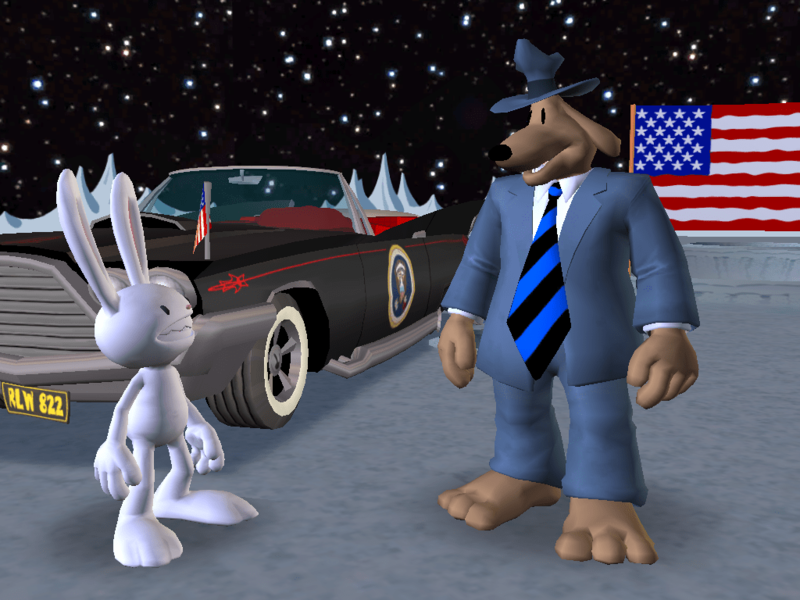 After Sam and Max expose the president as a robot phony, the country is thrown into an emergency election. 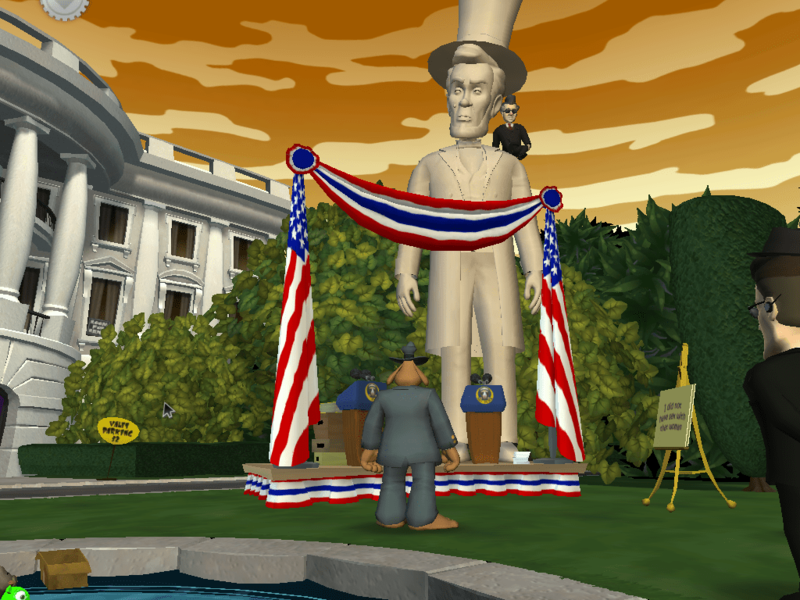 Max is chosen to run, and he goes up against an animated Lincoln Memorial. This one is free on Steam, if you’re interested. Sam and Max receive a call saying that computers all over the world are malfunctioning. At the same time, Sybil introduces our duo to the alternate reality video game, Reality 2.0. Are the two connected? Jump into Reality 2.0, and find out. Plus, you get a turn-based battle system (sort of). In an overly-complicated and illogical series of deductions, Sam and Max uncover the mastermind behind every adventure of the season (no, I won’t spoil who). They go to confront the villain on his (that’s all you get) base of operations, the moon. Apparently, we can drive to the moon now. Isn’t that something? So, in total, we have 6 incredibly funny games forming one semi-cohesive package. Is the package good? Yes, I think so. The characters are well written and well voiced, the music is great, and no chapter feels like it goes on for too long, But remember that it is an adventure game. Traditional adventure games are never perfect, thanks to their insistence on illogical logic puzzles that do nothing but impede your progress. The puzzles in this game are not nearly as bad as I’ve seen, and Max carries a lot of the experience on his innate charm alone, but thanks to that, I can only give the game a 3.5 out of 5. Also, this game is not worth $30. Get it on a good sale. And, just as a reference, I’d never give an adventure game over a 4, though that could change once I finish The Walking Dead. But before that: Season 2! This review was based on the PC version of the game. This review copy was supplied by the reviewer.